Dilip Sanghvi’s family home is unmistakably minimalist. 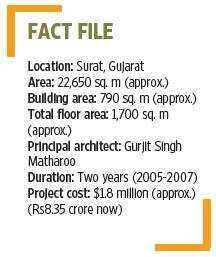 It also bears the subtle finishes that have marked much of Ahmedabad-based architect Gurjit Singh Matharoo’s work over the last 17 years. In designing Sanghvi’s home, Matharoo referenced the family business (they are diamond merchants), but stopped short of “bling". Even glamorous and expensive onyx, occupying an entire wall along the length of the house, exudes utilitarianism—binding together the functions of the spaces it flanks and softly lighting up the whole house. Concrete and onyx represent two facets of a diamond—the rough unpolished stone and the polished gem. Natural light comes in through a skylight, bouncing off bare concrete textured to resemble stone blocks, exuding warmth. The “stone" finish was realized using fibre reinforced plastic (FRP) moulds. A total of 150 moulds were made to minimize repetition and keep the look natural. Structural elements are not hidden—no false ceilings, camouflaged pillars or beams. Utilities, such as pipes and wiring, are not concealed, so changes and repairs don’t call for any demolition or dismantling. Yet these are tucked away cleverly. You can enter the house from two sides, through the formal and informal living spaces, respectively. One entrance opens into the family area, the other leads directly into the formal living and dining space and the veranda. The main entrance has a custom-designed door that curves gracefully when opened (see Adapt). Next to it are three identical flights of stairs: one functional, two hanging upside down from the ceiling along the flanking walls. Sculptural monkeys play along them. The functional set of stairs leads to the gym on the first floor. The first floor also has the master and children’s bedrooms, a study and a library that overlooks the formal living space. The ground floor has the formal and informal living areas, guest bedrooms, a puja room and Sanghvi’s mother’s room. From the gate, a ramp leads down into the basement parking. Here, the east wall supports the entire roof without any pillars or visible beams. This allows a large sedan, such as a Mercedes S-class, to make a full turnaround without brushing the other three parked cars. There are no supporting columns within the onyx wall on the ground floor, which means the master bedroom above the formal living area is suspended from the roof slab, an ingenious solution achieved by principal structural engineer Rajendra Singh Matharoo (the architect’s father). The interior design reflects the minimalist architecture. For the most part, it showcases the intrinsic beauty of structural materials: solid Burma teak doors and cabinets, glamorous onyx and travertine, humble kota and cudappah stone walls and counters. Downstairs, master weaver and designer Rajan Chaudhary’s bright dhurries (rugs) hold their own against contemporary Italian furniture and lights handpicked by Sanghvi and Matharoo. The first floor has wooden flooring. The bedrooms have storage discreetly tucked away in dressing areas. The house is oriented towards the garden, with large windows overlooking it, their wooden louvred screens providing diffused light. These screens also conceal electrical wiring, heating, ventilation and air conditioning (HVAC) ducts, plumbing and drainage pipes. Above the louvres is a channel that holds rainwater, letting it overflow as a falling screen during the rains, creating a bit of magic. After the hype when it was conceived about two and a half years ago, the Bloomframe balcony is now in production, giving apartment dwellers who feel cooped up an option that defies the confines of their homes. Designed by the Amsterdam-based firm Hofman Dujardin Architects, this innovative window frame folds down and out to become a balcony into which users can step. The Bloomframe balcony can be installed in both new and existing buildings. In the Sanghvi residence, designed by architect Gurjit Singh Matharoo, the wooden door at the main entrance has a handle sculpted from the same block of wood it sits on—functional beauty at its finest. In case you are not able to find a single piece of wood with sufficient thickness to carve out a protrusion, try moulded acrylic or have the handle joined in such a way that the joint does not show. The San Francisco-based design blogger and product designer Emily Pilloton’s book ‘Design Revolution: 100 Products that Empower People’ will be released at the end of the month. In the book, Pilloton, who launched Project H Design, a non-profit venture that supports “life-enhancing, humanitarian design" (according to the book’s blurb), features Braille-based building blocks for children who are not sighted, safer baby bottles, a waterless washing machine, wheelchairs for rugged terrain and the daily dump composting system developed in Bangalore.